An angry crowd attacked a cop car in Oakland, California after law enforcement responded to a sideshow involving about 700 vehicles. There were reports that a police helicopter was shot at. One person was killed after pointing a replica gun at officers. On Sunday night, some 700 vehicles took over several highways and streets in Oakland, which was followed by an influx of cars from Fresno and Los Angeles, and motorcycles from nearby San Jose, according to local sources. Some of the vehicles involved began spinning and performing “donuts,” stopping traffic for all other motorists and causing a backup. On-the-spot footage posted on YouTube shows how a cheering crowd surrounds the vehicle and start damaging it. 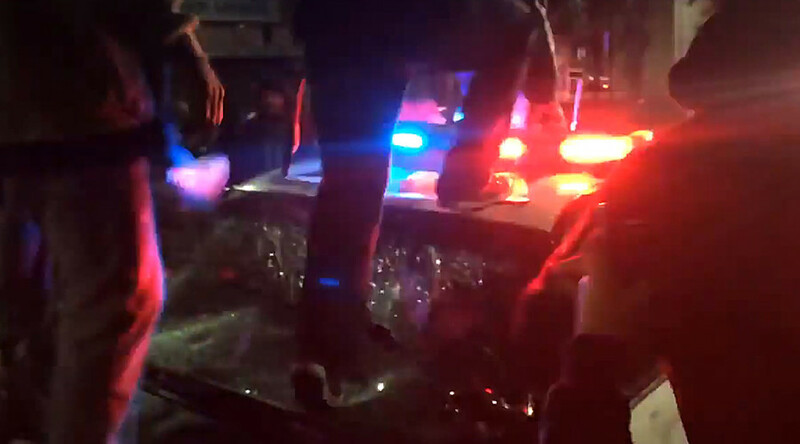 A handful of aggressive attendees are seen kicking the car from both sides, with some of them jumping on its roof. Gunfire was also reported from several spots in the city, while police received reports that at least one of the shots was aimed near one of its observer helicopters. "We did receive reports from officers on the ground that shots were being fired in the vicinity of the sideshows," said California Highway Patrol Officer Sean Wilkenfeld, as cited by San Jose Mercury News. "Our helicopter was overhead assisting with enforcement operations; however, the crew did not report any damage to the aircraft." Oakland police officers shot and killed a person in East Oakland on Sunday evening. The officers were reportedly towing one of the sideshow vehicles when they were "approached by a subject who pointed a firearm in their direction,” according to police. OPD O.I.S. in area of 90th/Bancroft. Ofcs working sideshow approached by sub who pointed firearm in their direction. Ofcs fatally shot sub. The officers fatally shot the individual. However, the “firearm” turned out to be a replica, and no officers were injured. The sideshow that preceded the shooting occurred around 12:45 a.m. local time on Sunday on Interstate 880 in Oakland, according to the Bay City News Service. Sideshow are informal and illegal demonstrations of automotive stunts that are often held in vacant lots and public intersections, most often in the East Bay area of the greater San Francisco Bay region. The sideshows first appeared at Oakland's Eastmont Mall parking lot where African-American youth had gathered.